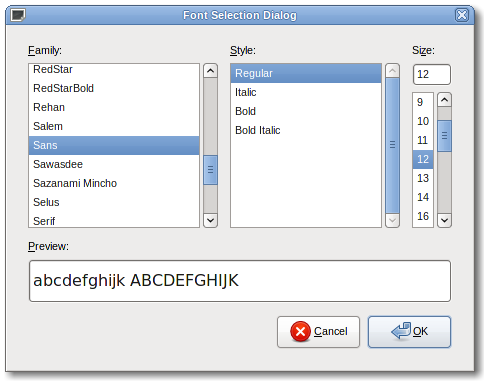 The GtkFontSelectionDialog implementation of the GtkBuildable interface exposes the embedded GtkFontSelection as internal child with the name "font_selection". It also exposes the buttons with the names "ok_button", "cancel_button" and "apply_button". gtk_font_selection_dialog_get_font has been deprecated since version 2.0 and should not be used in newly-written code. Note that this can be a different string than what you set with gtk_font_selection_dialog_set_font_name(), as the font selection widget may normalize font names and thus return a string with a different structure. For example, "Helvetica Italic Bold 12" could be normalized to "Helvetica Bold Italic 12". Use pango_font_description_equal() if you want to compare two font descriptions. gtk_font_selection_dialog_set_font_name is deprecated and should not be used in newly-written code. a font name like "Helvetica 12" or "Times Bold 18"
gtk_font_selection_dialog_get_apply_button has been deprecated since version 2.16 and should not be used in newly-written code. Obtains a button. The button doesn't have any function. the GtkWidget used in the dialog for the 'Cancel' button. the GtkWidget used in the dialog for the 'OK' button. the underlying widget for selecting fonts.